Pityriasis versicolor or tinea versicolor is due to yeast-like germ called malassezia or pityrosporum. Few germ commonly live on the skin surface, and is not harmful. Though, few person are prone to this germ, where this germ multiplying on their skin surface more than normal, that leads to a rash characterised as pityriasis versicolor. Oval or irregularly-shaped spots of 1/3 to 1 inch (0.5 to 2.6 cm) in diameter, often mixed together to form a bigger patch. At times fine scaling of the skin producing, superficial ash-like scale. Pale, or pink in color, with a red undertone which can darken when the patient is exposed to sunlight or overheated. Severe 'pin-prick' itching in the affected areas, usually ater sun exposure without sweat, but once sweating start this 'pin-prick' itching stops. Underarm, upper arm, chest, lower legs, and neck are commonly affected. and at times it may be present on the face. Person with dark skin tones, complaints of pigmentary changes, or loss of colour or hypopigmentation, where as in person with lighter skin color, hyperpigmentation is more common. These discolorations of skin is also termed as 'sun fungus'. In summers petriasis alba can be notice as uneven patches. The patches are pale red or brownish, and scaly. The patches may merge into big patch that give it a map appearance. Due to Sun exposure color become even and makes it less visible. In autumn season, patches of affected area become scaly and change its color to white. As per Dr.abhishek mostly patient come for doctor consultation at this stage. Person who suffer from excessive sweating or with high sebum production, specially teenagers. Person with an immunodeficiency following diabetes, Cushing’s syndrome. Person who are on medications such as corticosteroids. Microscopic examination: Scrape test, after dissolving the scales in potassium hydroxide reveals the branched hyphae and round spores of the yeast, the classic spaghetti and meatball appearance. 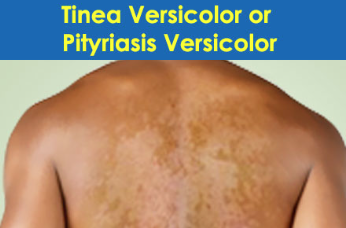 As per Dr.Abhishek clinical experience at Aura Homeopathy, Pityriasis versicolor or tinea versicolor is a internal disorder hence cure is possible only with well selected Internal homeopathy medicine, Homeopathy helps reducing the rashes as well as discomfort and tching completely that to without suppression and side effect of any kind. There are 83 homeopathy medicines which give good relief. And best suited medicine can be selected on the basis of complet case taking.